You Accidentally Invited 20 People for Dinner...Now What? Tips for throwing a large dinner party—even if you don't have enough cutlery, linens, or table space. I am the kind of person who bumps into you in the street and insists that you to join us for dinner. I have a habit of planning a supper party for four, then six, and then—by the logic that to cook for six or to cook for eight makes no great difference, and that wouldn’t it be nice to catch up with James and Mary, too—somehow end up cooking for twelve or fourteen. We serve dinner in our kitchen. And it is not a big kitchen. I long ago made peace with things not being perfect. Or at least not perfect in any conventional sense of the word. If we are more than eight, our cutlery is mismatched—not because bohemian shabby chic is my thing (though it has its own higgledy-piggledy charm to it), but because that is the way it has to be if we are to eat with cutlery at all. Once you accept that entertaining on a grand scale more often than not means rules will be broken and corners cut, somehow it all becomes rather more fun. 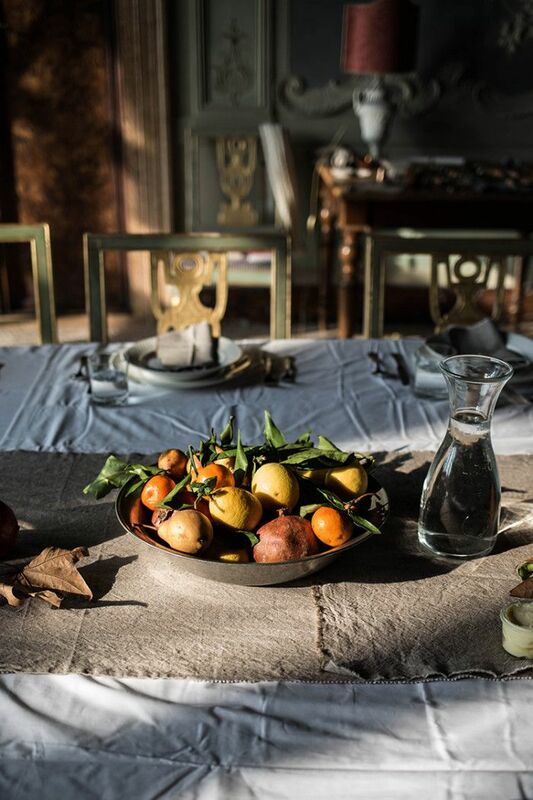 After all, it is neither the quality of the food nor the elegance of the crockery that makes a table feel welcoming or a meal shared together the stuff of lasting memories. Think ahead and plan the meal around what you will serve it on. As much as I love to cook what I fancy eating, when I am cooking for more than eight people, I plan the menu largely for ease. This means that oven space and serving dishes are my primary criteria. I will think in terms of the number of plates that we have: So, a starter in a bowl (perhaps a creamy soup in the winter or a chilled soup in the warmer months) to be eaten with a soup spoon; a main course on a plate (like a nice roast); and the dessert in a glass or small jam jars, to be eaten with a teaspoon. Essentially, what I like to avoid is the need to do any dish-washing up between courses; I like to stretch a single set of cutlery out across a meal. If I don’t have enough cutlery, I will cut out the starter and stick to two very enjoyable courses. Better still, serve food that is best eaten with your fingers. So, I might skip a formal starter and begin with plates of salami and ham. 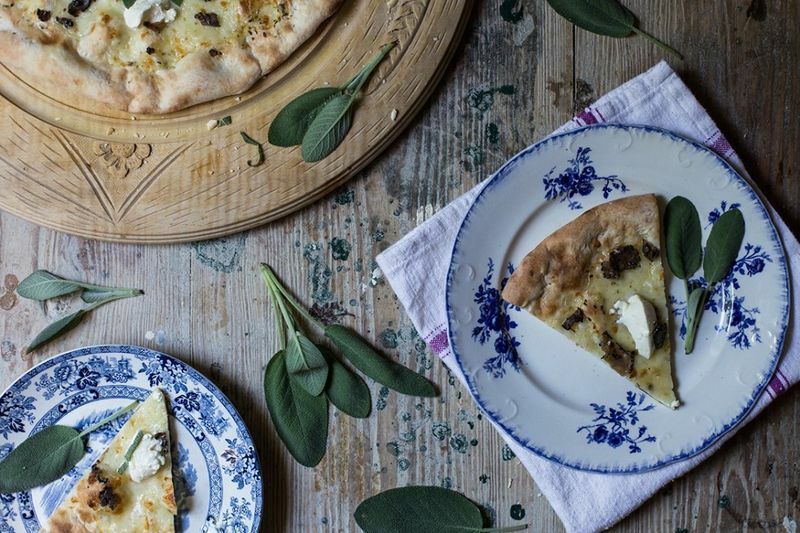 I might make it a pizza party: homemade crispy thin pizzas, topped with something fancy like black truffles and mascarpone, served on wooden boards laid down the middle of the table. Perhaps a big green, fennel salad on the side. 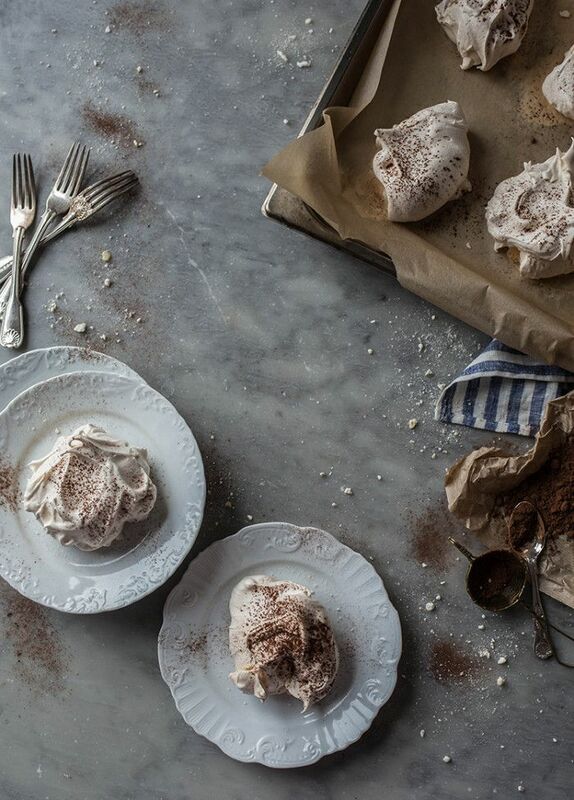 And handheld individual desserts: meringues heaped high on a cake stand so that everyone can just help themselves; caramel apples on sticks, or homemade gelato served in cones. I have learned to be relaxed about mixing things up, though I try to keep plates on a similar color palette or theme when I can. So, I will lay the table up with all white plates. And then when it comes to serving dessert, I bring out painted vintage plates, no two exactly alike but all with a similar feel. If in doubt when buying spare crockery (and if you entertain often, I do think it is worth investing in a few extra plain plates), go simple and white. 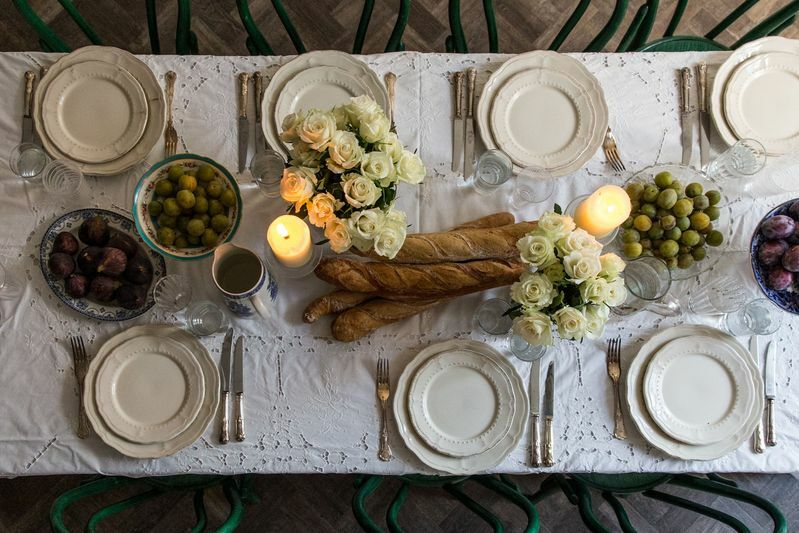 Linens do a great deal for for elevating a simple kitchen supper to feeling rather more of a grand affair. I can’t help but feel that there is something decadent and romantic about a linen or cloth napkins. Again, I always go white—even if it’s just a sheet laid over the table (perhaps with a runner on top). Matching napkins is a nice and inexpensive touch (especially if the crockery is a mix of odds and ends). If you don’t own a set of napkins, then buy a run of linen and cut it into squares, leaving the edges rough. Invest in food (and wine) over decoration.As much as I love a table laden with flowers, when you’re cooking for large numbers there is no need. 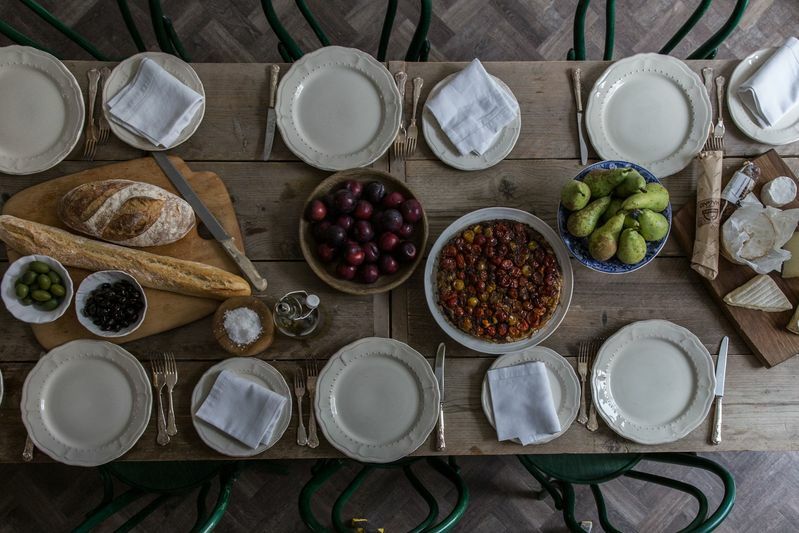 A table groaning under the weight of dishes—be it plump roast chickens and all their trimmings piled high in roasting tins, or plates and plates of sharing dishes—is captivating in itself. As a rule of thumb, my table is never set without a pile of breads (baguettes, I think, look particularly nice), a nice jug of water, and a couple of bottles of wine. And in the evenings, I add a few candles. If you end up being more people that you can comfortably sit around the dining table, set dinner up as a buffet. Lay the food out on the table, along with piles of knives, forks, plates, glasses, napkins and so forth. Don’t worry too much about having enough of each. 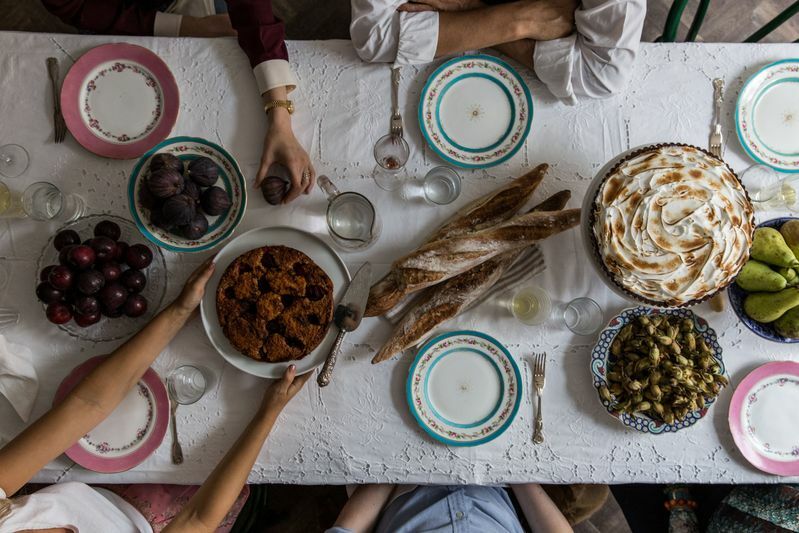 In an informal setting like that, people will happily take the first plate and pass it along, just as they will happily perch on the sofa to eat supper. Just keep the menu as fingers-focused as you can. A nice paté, served with cornichons, pickled onions and bread. On top of the plates for the main course, lay out small side plates; serve the paté in jars with a few extra knives; encourage everyone to tear off chunks of baguette with their hands, smear generously with paté, top with a few cornichons and eat with their fingers. 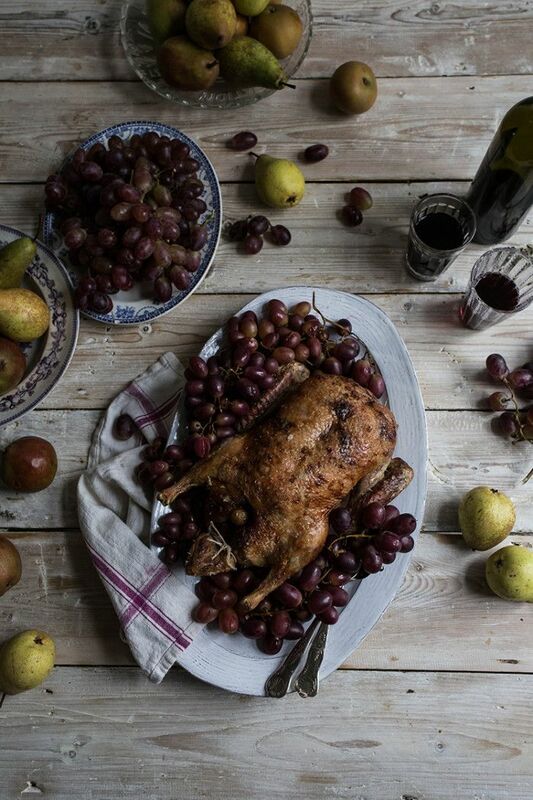 Roast duck with roasted plums and roasted potatoes. I would roast two birds for eight to ten people. 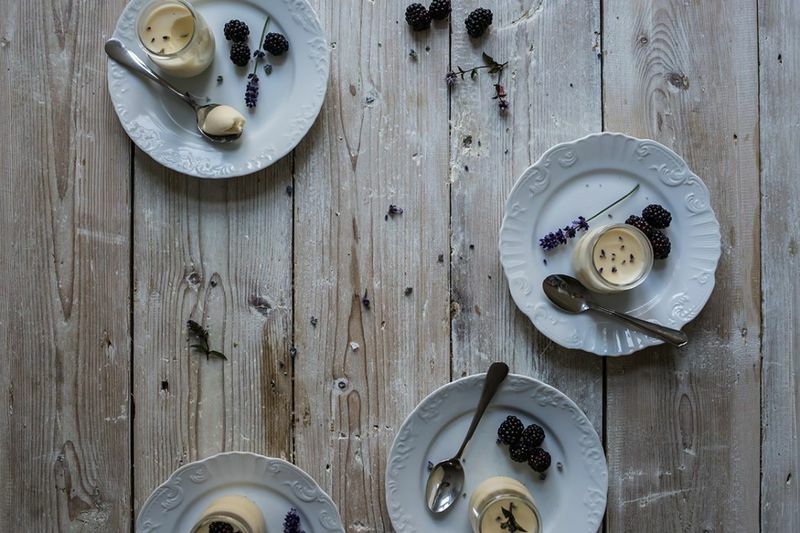 Lavender panna cotta served in individual glasses, small jam jars, or glass yogurt pots and to be eaten with a teaspoon. Lay out all the plates, bowls, glasses and cutlery that you have and let everyone help themselves as they like. Remember also that people tend to eat less when they’re standing around, so you can cater accordingly. I like to divide each dish between two serving platters so that it is easier for guests to mingle and get to the food. Twenty or so handheld mozzarella and tomato puff pastry pies. 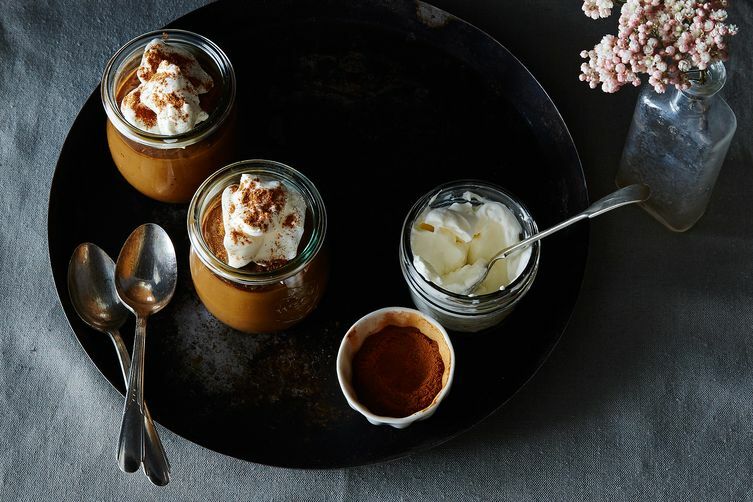 Make these in advance, store them in the fridge, and bake them off as your guests begin to arrive. To serve, just place the roasting trays with the piping hot pies on the table and encourage everyone to help themselves. Offer extra napkins, as they can be a little messy to eat. Whole cheeses and bowls of fresh fruit. Gorgonzola and pears are a particularly nice match, but also plums and figs with ricotta and pecorino. These double as decoration, as they are so pretty to look at. Two smoked hams with a pomegranate molasses glaze, cooked in advance and served cold. Lay out extra pots of mustard for guests to help themselves. Pinzimonio, laid out on two large dishes, with a couple of smaller bowls of olive oil, so that guests can dip in the vegetables. 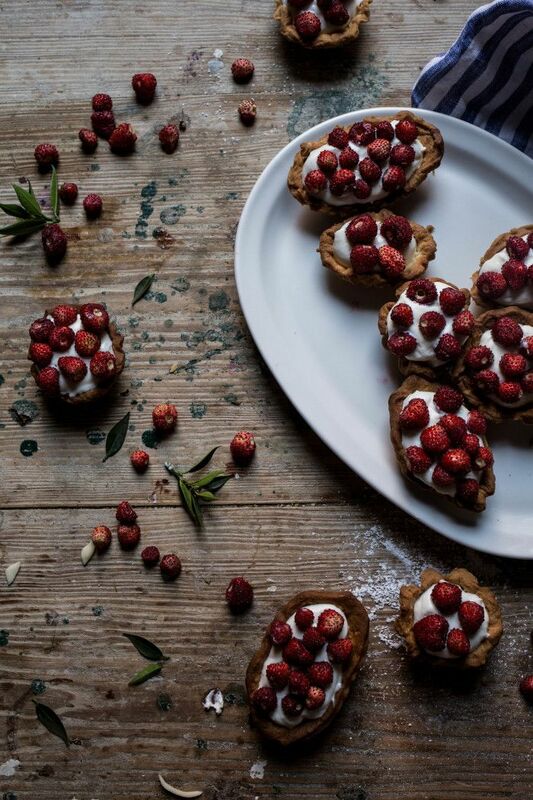 Whipped ricotta tartlets topped with seasonal fruit. Slices of plum or fig would be nice right now. Olive oil gelato served in cones. How big was the largest crowd you've ever hosted? And how did you survive? Tell us in the comments! My Thanksgiving this Year. We invited 24, I cooked for probably 30 so had plenty of leftovers for everyone to take home. One ham on the grill, one large turkey in the oven, three beef tenderloin on the grill, roasted vegetables stove top and charcoal grill, cheesy potatoes in the slow cooker, dressing/stuffing, mixed salad. Served buffet style with all white plates, mixed utensils we collected over the Years and lots of wine, beer and laughter. Looking forward to Christmas cooking for 25+ thinking lasagne, chicken baked in a tomato sauce, lemon caper salmon, stuffed mushrooms, always loved cheesy potatoes, mixed salad. Any suggestions for easy prep dish either main or side that could compliment this mix? having thanks giving dinner with 20 plus guest in our new house . the table fits 19 comfortably. wife is getting nervous. she is suggesting buffet, but its thanksgiving and not sure about that . suggestions?? Usually, my private maximum headcount is about 12, and I often prepare things like moroccan meat pastry (a bit like samoosas) which I can just put in the oven when time is right, lots of salad, veggies and dips or also tapas varieties, and I will make use of the barbecue grill whenever I can (for ease of things and because my other half will gladly run the grill), or do something I can roast in the oven while having a chat with the guests. I once held a fundraising garden party where about 45 guests had responded to coming. I think the count for the day topped out at 68. Great fundraising but extreme stress. However my best effort was a Christmas lunch. I had a 6 week old baby and 30 family and friends over. (To be fair that was inclusive of 10 children). Fortunately Christmas in Australia is mid summer so the kettle BBQ was busy making baked ham and the normal BBQ was pressed into service for various finger foods. That year all the cutlery and plates matched. They were all plastic. I was an Army wife. When my husband reached the rank of Colonel, entertaining was a given and was frequent, from potlucks, wives' coffees, unit "hail and farewells", to annual Christmas parties, which usually numbered up to 75 people. I always did buffets for the largest groups: a large bone-in ham, two roasted turkey breasts, small rolls, condiments, a fruit salad, maybe a pasta salad and a veg salad, and assorted holiday desserts like fudge and cookies.